Permafrost terraces interspersed with dwarf shrubs and sedge meadows. Climate change is already impacting polar habitats such as the Arctic tundra, where increasing temperatures are causing permafrost to thaw and exposing soil and organic matter that have been buried for thousands of years. Many scientists predicted that this soil, once exposed, would release a massive amount of sequestered carbon into the atmosphere, contributing to a destabilizing carbon-warming feedback loop that would drastically increase the amount of carbon dioxide present in Earth’s atmosphere. 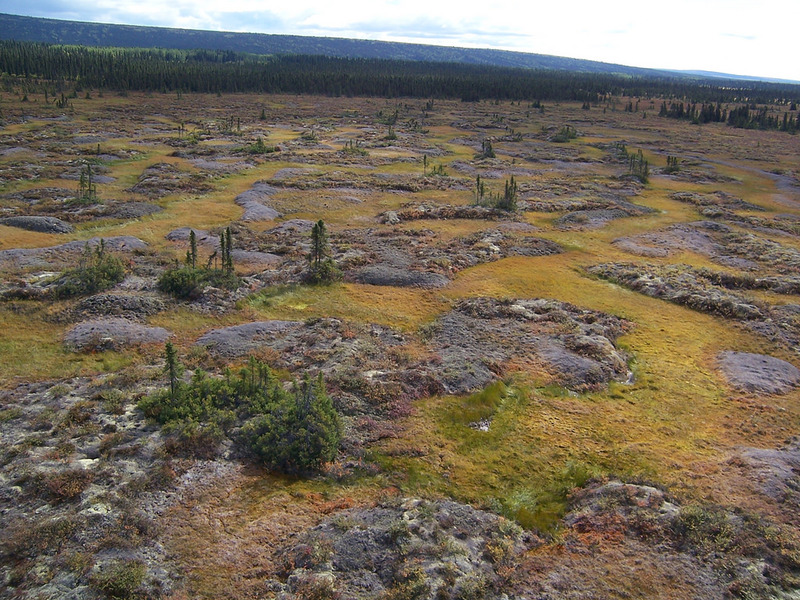 However, researchers from the Arctic LTER site recently described a surprising phenomenon: the expansion of shrubs and other vegetation in the region (due to the increase in available soil area) may largely mitigate loss of soil carbon into the atmosphere. Over a four year period, the scientists gathered data from two different plant species: a native sedge (Eriophorum vaginatum) and a shrub (Betula nana) that has been rapidly expanding across the Arctic as temperatures rise and permafrost thaws. The researchers found that microbial respiration in soils under sedges produced twice as much carbon dioxide as in soils under B. nana shrubs. The shrub soils retained 150% more carbon below-ground than the sedge soils, possibly due to the higher-quality leaf litter produced by the shrubs. One effect that researchers were concerned they might find is “priming,” in which the addition of new, easily decomposed organic matter increases the decomposition of native soil organic matter. They found no evidence of priming in soils underlying either vegetation type. The general consensus up to now has been that as temperatures rise and permafrost thaws, the amount of carbon dioxide released from Arctic soils would increase. This new Arctic LTER study provides evidence that as shrubs colonize newly available soil—given the right microbial and geographic conditions—they may be able to mitigate this release of carbon dioxide by sequestering much of it underground. The implications of this new understanding about shrub-mitigated carbon dioxide in the Arctic will help improve future climate models and decision-making around climate change adaptation. This story was corrected on July 30, 2017. Permafrost was originally described as “melting,” which does not happen. Permafrost thaws.